Day 2: Either go visit to Dian Fossey’s grave Or Climb the Bisoke Volcano(3711m)with a beautiful lake on the top. Or Combine your visit of Golden monkeys and Caving in Musanze. 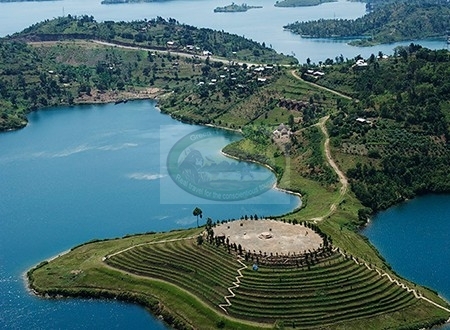 Day 4: After your breakfast start Hike or Bike to The Rubona Hill view, this place offers a good panoramic view of Lake Kivu, volcanoes; both towns Gisenyi and Goma in DRCongo, continue to Gisenyi Lake Kivu Beach and visit the 2borders with DRCongo. Visit the community in Gisenyi city and later in the afternoon interact with fishermen. Overnight in Paradis Malahide. Day 5: Hiking or Biking from Gisenyi/Rubona village to Cyimbiri village on the congo-nile trail which is a long Lake Kivu. On the way stopover for beautiful photography; visit local community and birdwaching and get the coffee experience from crop to cup with the coffee famers. Relax on private beach and spend a night with the community in Cyimbiri Bay. Day 6: Hike or Bike from Cyimbiri to Kinunu via Nkora Fishing village and arrive there on lunch time. From Kinunu continue experiencing the best of Congo-nile trail driving in typical villages, interact with people, visiting local markets, learning a lot about Rwandan culture. Spend a night in Kinunu. Day 8: In morning after your breakfast, drive to Nyungwe National Park. On the way visit Esperance Orphanage in Mugonero. Many stopover on the way for photography. Arriving in Nyungwe check in Nyungwe Forest Lodge and spend the evening relaxing in this beautiful lodge. Day 9: Visit Isumo water fall or just go for chimpanzees in morning or combine them with a visit Tea plantation and factory. Stay relaxing at Nyungwe Lodge. Day 11: in morning after your breakfatst we will drive to the airport for your departure.